The Ice Rink (La Patinoire) provides the location for Dolores, a film-within-the-film in production under the less-than-watchful eye of its nameless Director (Tom Novembre) and Producer (Marie-France Pisier). The stars (Dolores Chaplin and Bruce Campbell) flirt and fool around offstage, while the rink's manager (Jean-Pierre Cassel) attempts to regale anyone who will listen with tales of his glorious figure-skating past. Meanwhile, the movie crew attempts to get the job done out on the rink, with few competent skaters among them. The Ice Rink bears some resemblance to Truffaut's Day for Night, blending the comic realities of making a movie with behind-the-scenes romance and gentle recognition of human frailty. The film gets off to a rolling start, exploiting the possibilities of its environment to the fullest as the crew slips and slides, hot lights melt the ice, the director attempts to direct an uncomprehending group of Lithuanian hockey players, and stunts go hilariously awry. But forty minutes into the film, one begins to wonder whether the story is ever going to go anywhere. There's some nonsense about finishing the job in time for a Venice film festival, and a rushed screening for the festival's ailing director drives the third act, but none of the characters truly engages our sympathies, and it's hard to care what happens after the dust has cleared. It must be said that director Jean-Philippe Toussaint succeeds in communicating his love of film with joyful abandon. His familiarity with the minutiae of lights and clapboards, makeup and stunts provides some hilarious "in-joke" humor, and the production team's climactic trip to the amazing Cinecitta studio complex in Italy provides a European response to the self-referential Hollywood comedies of the 1930s. And the cast seems in tune with the film's style, taking their comic lumps with commitment and good-natured humor (though cult favorite Bruce Campbell doesn't get to show off his established physical-comedy chops to any great degree). 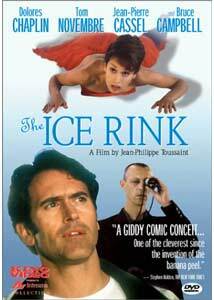 The Ice Rink has been compared to the work of Jacques Tati, according to Kino's pressbook, and it may be seen in historical context as a reaction to the more dialogue-driven French comedies of recent decades. The wacky bits are often truly inspired, with a daring silliness that is very refreshing. Unfortunately, The Ice Rink doesn't do much with our laughter once earned; instead, the movie continues to trade subtlety for slapstick at every opportunity, obscuring its love-and-life subtext with pratfalls and stereotypes. Fun, but unfulfilling entertainment. Image Transfer Review: Kino persists in presenting worthwhile films in nonanamorphic format, letterboxing the 1.85:1 image within a 4:3 frame. The transfer is drawn from a 30-fps video master, with evident 3:2 pulldown and some scan-line instability. The source print exhibits significant dirt in the vicinity of reel changes, with middling shadow detail, though the image is generally passable otherwise. It's just that it could have been so much better. Audio Transfer Review: I don't know what happened to the original source, but The Ice Rink, released theatrically in Dolby Digital format, appears as a Dolby 2.0 Surround presentation on DVD. Stereo separation is strong, with nice imaging across the front soundstage and solid frequency range devoted to the film's eclectic classical/pop soundtrack. Surround usage is rare but effective; as is the case with the video, this is a reasonable DVD soundtrack that should have been better. Extras Review: The Ice Rink comes to DVD with few extras in tow, just its original (brief and somewhat noisy) theatrical trailer, with eight additional trailers for Kino on Video releases: Himalaya, The Legend of Rita, Kippur, Wong Kar-Wai's Happy Together and Fallen Angels, Ogre, Those Who Love Me Can Take the Train, and Institute Benjamenta by the Brothers Quay. All of the trailers are in Dolby 2.0 audio format, with nonanamorphic transfers in aspect ratios ranging from 1.33:1 to 1.85:1. Subtitles are burned into the film print, leaving French-speaking viewers with an unavoidable visual intrusion. The Ice Rink is a fluffy little comedy about filmmaking, with some very funny moments that very nearly compensate for its general aimlessness. Kino on Video's DVD features a middling transfer, and few supplements. Worth checking out for fans of slapstick comedy, but not a must-see.